How can an imperfect person find access to an absolutely holy God, both in this life and the next? How can a person get right with God? If there is a way, only God can provide it, and an important part of that way is revealed in the burnt offering. Since this was the only offering that completely went up in smoke—nothing remained—it signified total surrender to God and God’s total acceptance of the offerer. This anticipates Jesus’ death which requires the surrender of the believer and provides assurance of God’s acceptance. “Are you the mother?” a strange man asked my wife after approaching our family. We had just finished attending a concert where the Plano Symphony Orchestra played “The Sound of Music from Salzburg.” It was outstanding! 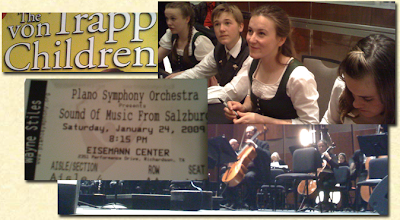 The concert included pieces by Mozart as well as a special appearance by the “Von Trapp Children Singers”—four young siblings who descended from one of the Von Trapps. My family and I love watching our The Sound of Music DVD, so we coughed up the change and bought tickets for seats on the front row. Great seats! That’s where we were sitting when the man behind us noticed us. And then we stood in the lobby, and his exuberant call to his wife brought his whole family toward us with smiles. Then it hit me. Oh, good grief! This man and his family thought Cathy and I were the parents of the Von Trapp children! After we clarified that our only children stood there beside us, we all had a good laugh. Then they sheepishly shuffled into the line to get autographs from the real Von Trapp kids. “For thirty seconds we were famous!” I told my family as we got in our van to leave. What a great reminder of the fleeting satisfaction that the pursuit of earthly fame offers. Isn’t it great to live for the glory of God instead of the fame of your own name? 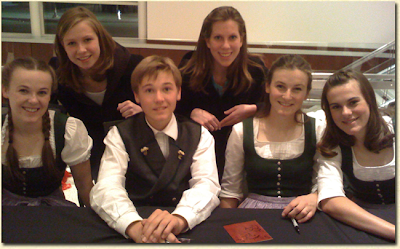 Okay, so here’s a picture of our kids with the Von Trapps. Can YOU tell which is which? “Judge not, lest ye be judged.” Our culture’s favorite quote by Jesus is seldom read in context. Jesus isn’t teaching that judgments are never to be made. But that before judging, we are to examine our own lives so that we can see clearly—rather than hypocritically. Every Christian feels a tension with the culture as their values conflict. To what extent should a believer engage the world? Where does the balance lie between being in the world but not of the world? It happens often. God’s people focus on their own needs to the neglect of the God’s commands. The wake-up call from God took place in Haggai’s day when God withheld His blessings. When the people repented and begin to obey, God immediately encouraged them with His presence and blessed them at the point of their obedience. Renew your commitment to God’s priorities as your priorities. Put first things first. Feel like you’re wearing a mask? Then consider the question Zechariah suggests: do your religious rituals reflect a life for God’s benefit or efforts to satisfy self? Since empty ritual reflects an empty relationship, we should walk with God sincerely . . . and shed the shams.